The squirrels have made a mess of my vegetable gardening attempts, this year, in a big way. I decided to see what I could come up with to keep them away. 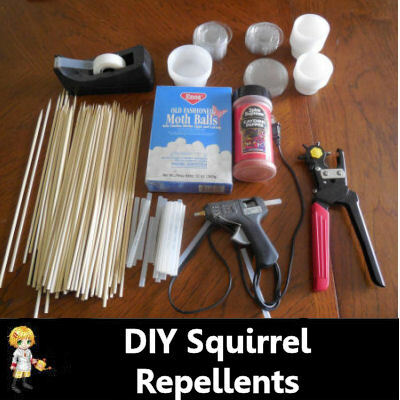 These DIY Squirrel Repellents were easy to make and did a pretty good job. I must admit that I have been so proud of my vegetable garden this year. It doubled in size of it from the one I had last year and it is now over 1000 square feet. My family’s favorite vegetable is the tomato and I wanted to make sure I had enough to last until the frost which is about late October here in NC. So, I planted 18 tomato plants thinking that would be more than enough. And it was, until a few weeks ago. You can read about my squirrel disaster here. After losing all my corn and much of my potential tomato harvest, I decided I had to do something. I researched, and asked on my gardening page on Facebook for tips on how to keep the squirrels away. Put out water for them. They are thirsty. Make a spray of cayenne pepper – they hate it. I contacted a good friend of mine who also writes a garden blog. She told me I was lucky it was not a drought year, or I would have NOTHING left in my garden now that the squirrels have discovered it. She voted for #1. I decided to try a combination of #5 and #6 for these squirrel repellents, but I have reservations about them as listed at the end of the article. Please read the whole article. Moth balls are dangerous in many ways. Be sure to consider this if you are an organic gardener. Please note: The comment section below should be used in conjunction with this article. I am also learning as I experiment with gardening. ****Please be aware that these squirrel repellents are, by no means, an organic gardening method. Mothballs are chemical in nature. Also, this is not to be tried if you have animals or children in your garden. Moth balls can look like candy and children might be tempted by them. **** Check out this article for natural squirrel repellents. Start out by punching holes all along the outer sides of the condiment cups. This allows the smell to escape which is what the squirrels supposedly do not like. 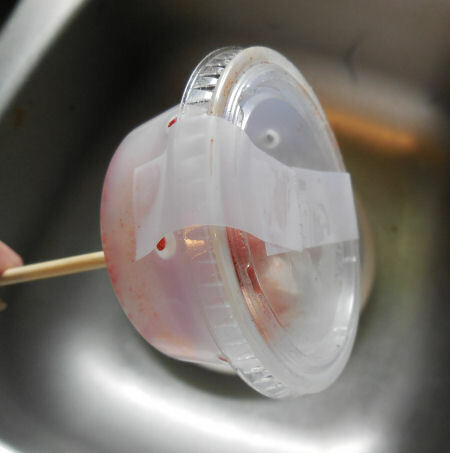 Next, use the glue gun to attach the bamboo skewers to the bottom of the condiment cups and allow them to set. This part takes a while. Use a lot of hot glue and be patient. At this point, your trap is ready. 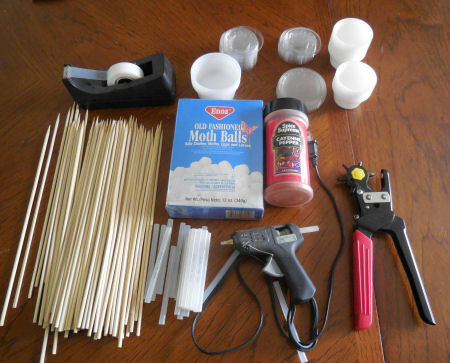 Take the moth balls, cayenne pepper and tape outside to your garden. If you have a problem with the moth balls being used, you could try just the cayenne pepper in the squirrel repellents to see if this will work. 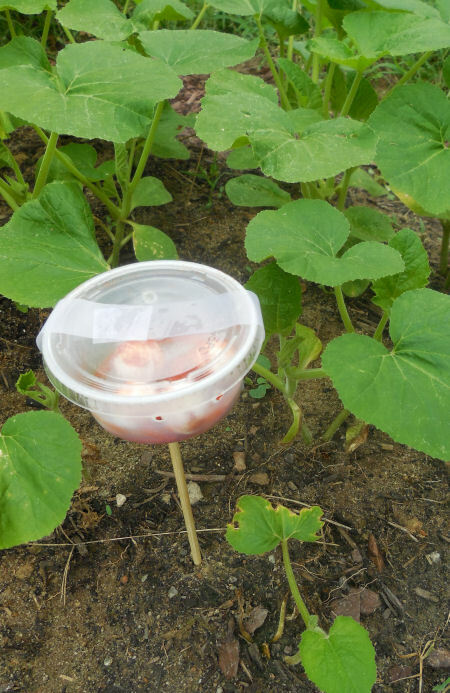 It is easier to do this when they are in the garden than to put the stuff in the cups inside. Plus not so smelly! 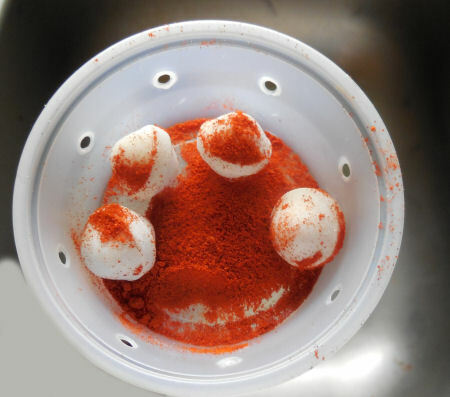 Add three or four moth balls (if you wish to use them) and a liberal dose of cayenne pepper to the cups when you get to the place where you want to put them. Tape the lid with scotch tape so it stays put. Place the finished squirrel deterrents near the plants you think the squirrels might go after about every 8 feet or so. I put mine in a new patch of summer squash, since I know they like them. That is all there is to it. Very little cost (less than $5 for as many as you could use). The hardest part for me was trying to find the condiment cups without buying 5000 of them at Sam’s club. A very nice person at a bar that my husband likes to go to with his friends took pity on him after three days of searching and gave him some for me to use. Thanks to the English bar maid at O’Malley’s Pub in Raleigh, NC. Will these work? Time will tell. Are these squirrel repellents safe for use? I am concerned about this. The smell of the moth balls was just horrible. I only opened the box of them and could smell them for HOURS afterwards in the house. Since they don’t actually sit near the vegetables themselves, I felt they would probably be okay, but am still undecided. I am going to make sure that I wash anything I bring in that is anywhere near them just to make sure. If you have used something like this to deter squirrels, please leave your comments below and particularly your thoughts on the mothballs. I have heard of people who actually fill socks with them and leave them in the garden, so I assume a few moth balls will be fine, but be careful. I’ll add more info on this as it comes to me from research and comments. UPDATE: **Please read the main large comment below. ** I feel that it is important information that should go along with this article. Many thanks to Dawn who took the time to write the comment! In hind sight, the idea of #7 – a cayenne pepper spray, is perhaps the best idea and I will write another article on how to make this and use it. ← Squirrel Damage in a Vegetable Garden. The mothballs are toxic insecticide. If you are trying to garden organically then be aware of this. They cause brain damage and even death in children by the way. Mothballs are a pesticide product that contain either naphthalene or paradichlorobenzene as active ingredients. Both of these chemicals are toxic fumigants (which means they volatilize into the air) and must be present in high concentrations to be effective. This is the problem. Concentrations high enough to be effective for pest control can be dangerous for anyone exposed to them. What are the potential health impacts? Symptoms of exposure to naphthalene include headache, nausea, dizziness, and difficulty breathing. Exposure to large amounts of naphthalene may damage or destroy some of your red blood cells. This condition is called hemolytic anemia. Some symptoms of hemolytic anemia are fatigue, lack of appetite, restlessness, and pale skin. Exposure to large amounts of naphthalene may also cause nausea, vomiting, diarrhea, blood in the urine, and a yellow color to the skin. Based on the results from animal studies, the Department of Health and Humans Services (DHHS) concluded that naphthalene is reasonably anticipated to be a human carcinogen. Paradichlorobenzene exposure has been linked to nausea, vomiting, dizziness, fatigue, headaches, eye and nasal passage irritation, and dermal irritation. If a pet eats a mothball made of paradichlorobenzene, they may have vomiting, tremors, and/or abdominal pain. Paradichlorobenzene may also cause kidney and liver damage in pets.The World Health Organization (WHO) considers paradichlorobenzene possibly carcinogenic to humans based on studies with mice. Personally I would not use them. They are not organic but chemical in nature. I would go for the cayenne spray before thinking about the moth balls. thank you for taking the time to write the comments. This was my main concern. My garden is fenced from my pets and I have no children but I do not want to do anything to cause problems in our food. I have read that making a cayenne pepper spray and spraying it right on the leaves of plants the squirrels might like is another option. have you tried a cayenne spray and how does it work with the squirrels? Used mothballs for decades to reduce winter animal and bug damage at our summer home. Didn’t do much about mice, but find about insects. I wouldn’t hesitate using them as directed on package. TY Lady Dawn for the heads up. I always knew that moth balls were bad, but I never knew just how bad…Thanks to you, now I know. I love feeding the birds but no matter where I put the feeders the good old squirrels eat the food and chew off the bottoms or the perches ,, would this cayenne pepper bother the birds if somehow I could put the pepper around the seeds ,,, ? squirrel problem, just deer and hares! The moth ball part might affect the birds but the cayenne should be fine. Squirrels are the ones who just don’t like cayenne. Once they try an area where it is, they usually don’t come back. Mix the cayenne with vegetable oil, soak bird feed in it. Birds don’t have mucus member sins in mouth so supposedly does not harm them. Squirrels supposedly get that jot pepper taste and leave it alone. Never noticed it reduced their attempts to set birdseed, however…. It is my experience that Cayenne Pepper has little or no effect on your common back yard birds. The reason for this is that birds do not have taste buds like squirrels do…so birds do not taste the pepper where as the pepper drives squirrels crazy in a bad way. one taste of the pepper is usually all it takes for the squirrels to learn not to touch the bird feed…and most often one whiff is enough. So if you want an organic, all natural squirrel repellent, Cayenne Pepper I believe is the way to go. I use a variety of squirrel strategies. 1 place fine mesh over your growing plants and then place sheep manure dried and mixed with topsoil. The squirrel groom themselves and hate to be dirty. I don’t suggest you feed the squirrels with other food as then you jus get more squirrels. has anyone tried the noise repellent ultrasonic sound wave repellents at home depot? I am sick of the quireels getting at my veggies. ANY ideas I have not mentioned please let me know. I had a problem with squirrels eating all the birdseed from my feeder. That wasn’t enough for them, though. I stored the feed in a large plastic trash can on the deck. 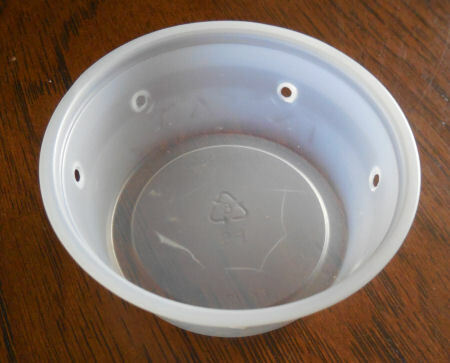 They chewed holes through top of lid! Fortunately I found a metal bird feeder that has a perch which closes the opening that allows the bird feed to be dispensed every time a squirrel sets foot on the perch. Also, I bought a small metal trash can for the bird feed, and store it in the garage. I now have a small platform that holds an ear of dried corn (which the squirrels love ) within three feet of the bird feeder, and the squirrels totally ignore the bird feeder. I feed all birds. Lol however I also have squirrels and chipmunks everywhere. A squirrel guard is a great you can get them at tractor supply, Walmart or even lowes. I have use cayenne spray in my garden more for rabbits it works great! the birds are not bothered by cayenne pepper Crisco works well on the bird feeded pole. I also made a metal downward facing hat like structure athat looks like a hat nd made it very greasy with Crisco and moved the bird feeder away from any railings or branches. There is a pepper suet that l found a t ace. It keeps them away – Really! Hi, Pricilla. I know this is a long time. Past the original post but I just wanted to let you k ow that cayenne pepper in the seed in your Bird feeder makes the squirrels scram! Birds sense of smell or taste isn’t as sensitive as a squirrel’s evidently so they are not effected by cayenne. Last year I sprayed my tomatoes with a mixture of cayenne pepper and water. I also sprayed around the garden because of opossums and raccoons. It seemed to do the trick. I also heard they did not like the smell of Avon Skin So Soft so I mixed that with water and sprayed the fence and about 3 feet from the garden. One or the other worked, I didn’t have any problems after I started doing that. I would never use mothballs either! To keep the varmints out of my potted plants I put rocks around them. They are from a creek and are rough. Squirrels don’t like rough things. I put plastic forks in the hanging plants and that keeps out the birds. thanks for sharing this. Lots of people seem to agree that the cayenne is the way to go, which appeals to me since I was not so comfortable with the moth ball part. LOL I’ve heard both pros and cons. I think the cayenne in boiled water, sprayed all over plants works pretty well. Have not tried it in bird seed though. I had a problem with squirrels in my garden. The way I resolved them getting in there was cheap and easy! I went to Dollar Tree and bought some children’s pinwheels and placed them around the outer edge of the garden. This has worked wonders and I don’t have to use any chemicals. I have tried Cayenne Pepper, but after it rains you have to reapply and it can get costly. I’ve heard that about the pinwheels. We don’t have wind here much so I sort of discounted it. Apparently the ones that are very shiny work well! I have tried the pinwheels and they didn’t work. Also tried wind chimes and that didn’t do any good. The moth balls do work but I just have used them around the house and deck to keep the squirrels away. We have planted corn two years only to have the squirrels dig them up for the seed. So we decided that next year we are going to enclose the garden. Will build sections like screen doors and attach them together making sure that two sections can be opened as doors. There are many veggies that I can enclose but I like to grow indeterminate tomatoes. That makes it so much harder. I doubt I will plant any corn next year, because that is what brought them to the garden in the first place. My boyfriend has it all planned out. He is going to hinge each of the sections together so that they can be opened and then taken down in the fall. We love corn and with all the things they are trying to do to seeds to make them grow faster and what not I would rather grow my own. This way I can get organic seeds and know I am eating the real thing. I have had some problems this year with my tomatoes being eaten when they are almost ripe. We put chicken wire around them and it seems to be helping. It just is a pain to take a section of it off when I need to weed the garden area. Use Electric wire and get a rat terrier. Best ideas yet! My Jack Russell will deliver every rodent she catches and kills to the front door to please me! Additionally, a slingshot and marbles from local thriftstore works great! We just moved a couple of months ago.ea which we have a huge yard and garden area. We have several large pecan, black walnut and chestnut trees which we love. We are looking forward to when we can gather everything. Our problem is that our neighbors say that we will be lucky to get anything before the squirrels do. We would appreciate any information and ideas that n give us. Not sure I am much help. I am still battling with them. They pretty much destroyed my garden this year no matter what I did. Trapping and relocating is most humane and sure way. Believe it or not, it is illegal to relocate squirrels in many states. Check with your state wildlife department first. Did not know that Bre. Thanks for the tip! If there are that many squirrels in the neighborhood, the humane thing is harvesting them. Making #1 the best choice. Meat us edible, skins can be cured and used for multiple things, tails are used for fly tieing and fishing lures. My mother has been waging a personal battle with squirrels in her backyard for several years now. She has a flower garden, and has regularly seen the squirrels run up, grab a bud, nibble on it, and then throw it down. Her solution was have-a-heart trapping (she lives in Florida – don’t know if it’s legal or not) and relocating to either her church or my sisters house – both more than 5 miles away. After trapping 64 squirrels, 2 opossums, and 1 rather large rat (yikes! ), she gave up. More squirrels just moved in to replace those that were relocated. So relocating is not a great solution, either. Hi Rachel. It does seem never ending with them. This year, I am trying a mix of some vegetables and mainly perennials in the same bed to see if I can at least save my veggies. We’ll see! I have also lost the war with the wildlife! Last season I had the best , big , juicy red tomatoes on the vine. I patiently waited until they were perfectly ripe and when I picked them, the whole back sides of them were eaten! Ughh! Motion sprinkles with cayenne water! That’d be the trick! This cutie is my squirrel deterrent. thanks for the tip on the product Crystal. Grey ground squirrels will kill: chickens, birds, and carry disease. Relocation is cruel- they get killed by the resident squirrel pack. New ones come and fill the holes. Only things to do: shoot them, use gallons of hot pepper or let them get in your attic and eat the wires and burn your house down. Grey squirrels are not the native red ones. They are aggressive and will bite humans if cornered. It would take a bucket of moth balls and they evaporate in a warm day. Moth balls are a nasty chemical to humans. Hi Carol. Normally I love squirrels, and have no problem with them. I’ve even had a couple as pets. But right now they are giving me a fit. This year I decided to plant container gardens and a bit around the house. Well I went and made some very nice planters for the back deck and the side of the house, and am about ready to place my Napa cabbage in and start getting ready for warmer weather vegetables. But in the last few days every planter has been dug up by the squirrel population here in Cary. The one in my back yard must have a Harvard degree, because the little bugger has totally outsmarted me, and waits until I am out of the house. I have just finished making two PVC squirrel traps like this: https://www.youtube.com/watch?v=7QoWJUEs5E0&t=11s . However I have also cooked up a gallon of spray repellent made with jalapeno peppers, cayenne, and onions. Hopefully this will keep the buggers out of the planters. Unfortunately the spray only works for 3-5 days and will need a twice weekly spraying. I’m not sure if North Carolina will allow us to take them elsewhere. But my 93 year old mother has a wonderful recipe for fried squirrel, grits, and smothered in squirrel gravy. My Mom is a great scratch cook, but this was my favorite breakfast growing up, when her friends and relatives could get her a batch. If that is the only good alternative, I am up to the task as soon as I am able to copy down the recipe from Mom. LOL! Incidentally, we here in the area have had a bumper crop of nuts for the past several years, hence the overpopulation of the little critters. We are in the opening stages of another Grand Solar Minimum(little ice age), and the climate is about to take a real plunge in the temperature range for the next several decades. So this year may be the one where the nut crop is bad. And when that happens the squirrel population will be starving to death, which is how nature controls over-population. The plus side is that there will be less of them. The down side is that they will be chewing on anything and everything they can get with their furry little paws. Anything that is edible. I noticed that you started this in 2013, and haven’t followed up with your successes. Are you going to show us your successes in keeping the little guys from harvesting your crops before you can get to them? Just curious. Hi John. ALL of the squirrels in my yard have a Harvard degree! Gosh that made me laugh right out loud when I read it in your comment. (My husband needs to meet you.) His sense of humor is very much like yours.) As to my successes. LOL What successses. These are Harvard degree squirrels remember. I gave up a long time ago on trying to defeat them. I now have three of those PVC squirrel traps set completed, and just now came in from setting up all three of them. I have one on my back deck, one on the side of the house, and one under the maple tree in my front yard. Wish me luck. And I will keep you informed of the success of either me,…..or them. LOL I bet I can guess who the winner will be. Mothballs are deadly to cats. We have 4 here all housecats so using them to deter the 200+ squirrels we have is not an option (some garden beds are right outside our windows) though I do like the condiment container idea. I live in Florida the squirrels are in bury and dig up mode all year round. I have found that topically applied citrus fertilizer works because it smells like a dead animal. although I do realize it is not the type of fertilizer needed for flowers and veggies you can compensate by using what the plants really need. you would have to reapply the citrus fertilizer about once a week depending on how often it rains or you water. 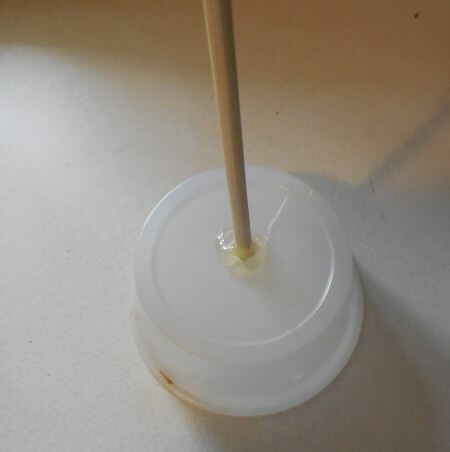 If your bird feeders are on a Shepherd’s Hook, buy a Dollar Store Slinky and coil it so the staff of the hook runs down the center of the slinky, then hook it to the top of the shaft and the squirrels will never be able to climb the Slinky. They climb the pole to a point when they have to grab the Slinky and they descend gracefully back to the ground a la gravity. After a while they look elsewhere, meantime you have some great entertainment. Look on YouTube for videos of it in action! I grow my tomatoes in containers. Could I just sprinkle the cayenne right on the soil in the container? I use a home made spray made from simmering water with hot peppers (habañero, cayenne, red pepper flakes, whatever I have), cloves, cinnamon and garlic. Works super well for both deer and squirrels, but you have to stay on top of spraying new growth or reapplying it after a rain. As soon as there’s new growth if I forget to spray it the deer or squirrels get it. I have read planting mint around the perimeter of my garden would deter squirrels. It seems they hate the smell. Have you heard of this? Administration: If you can, please remove my last name from my post. I created a garden from a broken cinderblock wall. It’s one of my favorite gardens because it is a hill and very visual. Over the last couple years we’ve added soil and compost so the perennials I’ve added are doing very well. My problem, beside slugs, are burrowing critters. In some instances I believe the roots of my plants provided a healthy meal for them over winter. Every time I fill in the holes they just add more. Would it be safe to drop a mothball into these holes? I’ve heard the toxicity of mothballs but if they are placed in only the holes do you think the smell would keep them away? Terrified of snakes!! Do mothballs keep them away? If you’re looking for condiment cups and live near a Dollar or Dollar tree store they sell them in small packages of I think 10 for guess what, yup only a dollar. The squirrels took every strawberry last year. The previous year I had 26 pounds. This year I bought 8 rat traps, and killed 16. I know this sounds mean, but I am surrounded by forest, and not willing to give up my families food for these rodents who have plenty of their natural food supply around. Next year the first time I see evidence of squirrels in my food supply, I will put out the traps again. The lrge basic wood ones are the best. I saw a device on amazon that looks interesting. You hook up your garden hose to it. It has a motion sensor so when it detects movement it will send out a blast of water. We also have deer in our yard. I bought some Irish Spring body wash that we will mix with water and spray around our plants. Don’t know if it will work but I will let you know! Now that sounds like a GREAT idea!